Well this week wasn't the most interesting. We did a ton of walking again yesterday. Our ward boundary is a little interesting so we have a neighborhood that is really far. So we went out there to see what is was like. We walked 20 something kilometers in like 3 hours. So we now have the date set for Alejandro and Irene for December 11th! We're also going to baptize Domingo and maybe Jorje. We're really excited for all of these people who are accepting the Lord in their life, it's really amazing to see the changes in their lives! As a side note I went and gave a talk yesterday. I'll give all of you some advice don't ever write the notes for your talk in the same spot where just a minute earlier you cut up an onion! jajaja yeah it's just as it sounds. Nevertheless the talk went well. The Lord loves us infinitely, always remember that! Well this week we had a few people show up to church. One of them we have been teaching on and off (mostly because we can't find him ever) we talked with him on Saturday and a co-worker/friend was there so we taught the restoration to them again. Well this man that we can't ever find is named Hector and well he bore his testimony of the Book of Mormon and of the prophet Joseph Smith so that was a bit of a surprise, we didn't know he had a testimony. He'll have to change a few things in his life and we're not sure if he understands everything but that was a pleasant surprise. So we also had that friend of his show up, Domingo is his name. That was also a great surprise. He doesn't live in our area but he'll be taught by two other elders. Also we had Irene and Alejando show up which has a miracle attached to it. Irene in Relief Society (as every sister in the ward tried to tell us afterwards) that in the morning while she was ironing the shirts that they were going to use for church all of the electricity went out. So she said ok God we're not going to church in wrinkly shirts so if you want us to go I need electricity. In that instant the electricity went back on! Oh the tender mercies of the Lord! So they came and both participated and loved it. Also their two kids went to primary and loved it! We just need to teach a few things before they make their first covenants with the Lord in their baptism! Well not much else happened this week, just lots and lots of rain again. It's definitely getting hotter too! Well this is the Lord's work and His glory to bring to pass our happiness for eternity! Have a great week. Chau! 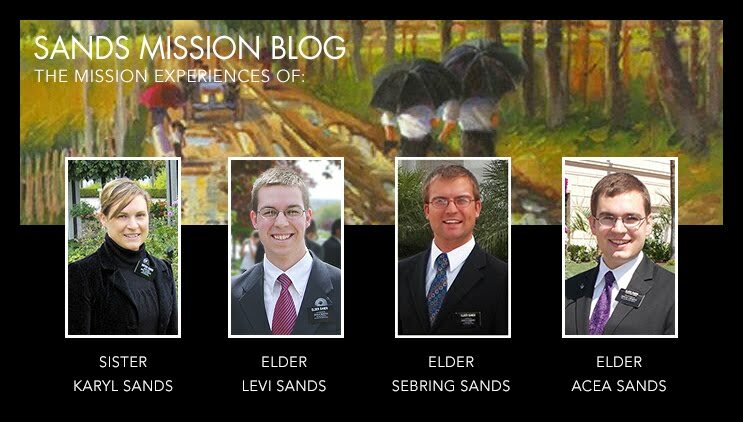 Elder Sands as some of you already know has been sending out voice emails rather than the traditional written kind. So, while we have been in contact with him nothing has been available for publishing on the blog. He will again be including something for the blog starting next week. So, to tide you all over here is one of his voice emails to the family that isn't too personal; enjoy!